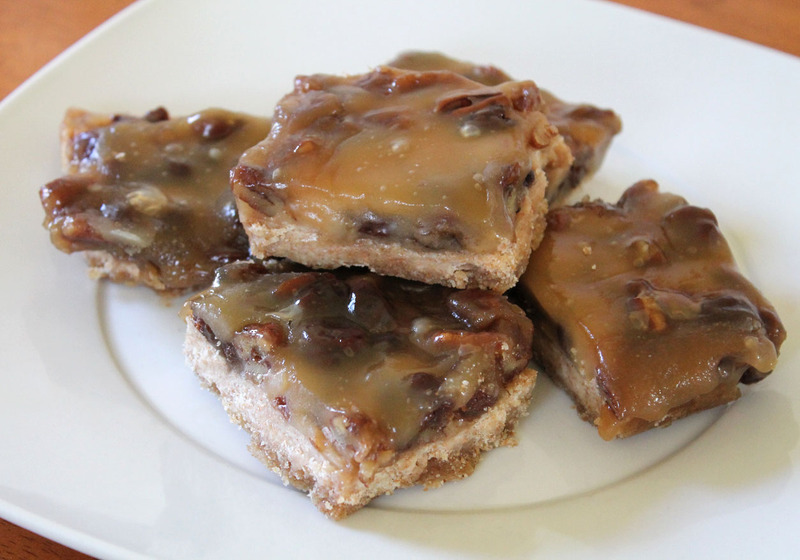 Pecan Raisin Butter Tart Squares | Live. Learn. Love. Eat. Whenever I come up with a recipe, it is always something I love. I love to make all of my old favorite foods not only vegan, but whole wheat and sugar-free too. I used to eat a lot of butter tarts before transitioning to a vegan diet. I have been dreaming of a healthy vegan version of those tarts for a long time now. 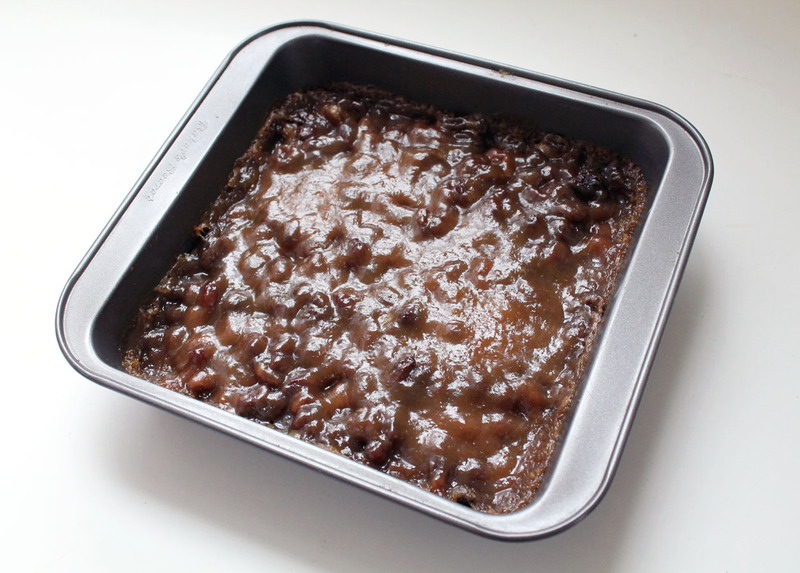 Instead of tarts, I decided to simplify the recipe by pressing the crust into a baking pan and making butter tart squares instead. A little mommy shortcut if you will. You could even just make the filling and place it into pre made tart shells if you wish. I wanted mine to be whole wheat so I made my own crust. These squares were perfect! They have all the flavor of a butter tart without all the refined sugar and flour. I also added both pecans and raisins to make them even more delicious. A gooey, sweet treat sprinkled with crunchy pecans and sweet raisins atop a flaky whole wheat buttery crust. All the flavor of a traditional butter tart, made with whole wheat flour, ground flax seed and pure maple syrup. You won’t believe that these are sugar-free and guilt-free too! Preheat the oven to 350°F. Prepare the crust by combining the flour, ground flax seed and sea salt in a medium mixing bowl. Cut the vegan margarine into the dry ingredients with a fork until the mixture is crumbly. Add in the cold water and mix until combined, yet still crumbly. 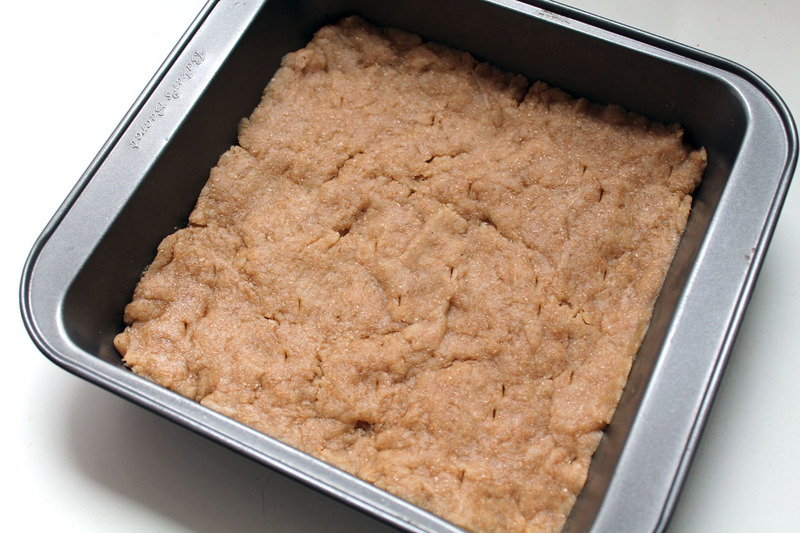 Press the crust mixture into a lightly greased or non-stick 8 x 8 square baking pan. Poke with a knife and bake for 8-10 minutes. While the crust is baking, prepare the filling. Whisk together the arrowroot powder and milk and set aside. Melt the margarine in a medium saucepan on medium heat. Whisk in the maple syrup and vanilla. Add the milk/arrowroot mixture and the flour and continue to whisk until the mixture has thickened. Remove from heat and set aside. 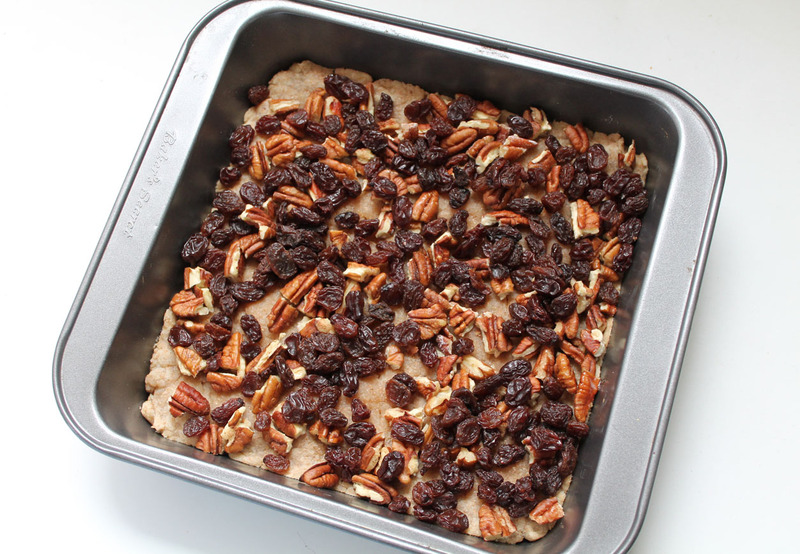 Once the crust has finished baking, remove it from the oven and top it with the pecan pieces and raisins. 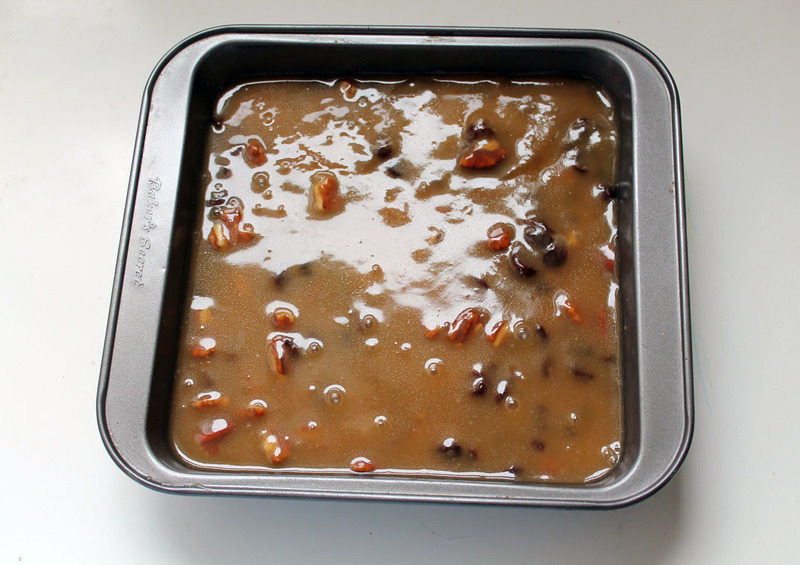 Pour the margarine/syrup mixture evenly over top of the crust, pecans and raisins. You may need to use a spatula for this part. Return to the oven to bake for 30-35 minutes, until the mixture filling is hot and bubbly. Remove from the oven and allow to cool completely before cutting into 9 larger or 12 smaller squares. Ummm, I think I WILL “forget” to share! These look awesome! What brand of vegan margarine do you use? All that I can find in Kroger (the store in our area with the most vegan options) is tubs of the spreadable kind, so I’m hoping to find a place with stick margarine to make baking easier. Mmm, they sound fab. Do you think they’d work without nuts? Thanks! You could definitely make them without nuts. 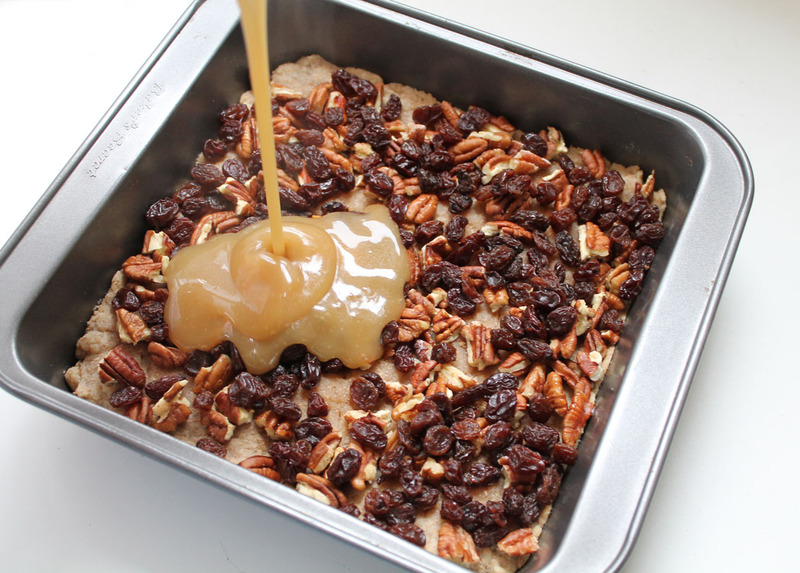 I just added both the pecans and raisins because that is what we like. Now this looks really yummy, I have to try it. An unrelated question: have you ever made non-dairy milks with nuts or seeds yourself? What were your experiences with it? Thanks! I actually haven’t yet, but I hope to soon. Next time I stalk up on almonds I want to try making my own almond milk. Could the recipe for dough you provided be shaped into tarts? I want to make these for my boyfriend and think it’d be cuter to give him butter tarts instead of butter squares. Do you think you could replace the whole wheat flour with an all purpose gluten free flour for both the crust and filling? Hi Cassandra! I do not know anything about gluten free baking or flours, so I am sorry that I can’t help you there. Maybe if you did a search about recipe substitutions for gluten free you could find out.